SugarCRM has acquired iExtensions, which makes customer relationship management (CRM) software for IBM Lotus Notes users, in a bid to attract more enterprise customers and compete better against bigger rivals like Salesforce.com and Microsoft. The announcement was made Tuesday at the SugarCon conference in San Francisco, where SugarCRM also released a beta of the Spring Release of its CRM software. The update adds “social CRM” features and native client applications for the iPad, Blackberry and Android devices. iExtensions’ technology will allow SugarCRM to build tighter integration with Lotus Notes and Domino, said Clint Oram, CTO and co-founder of SugarCRM. Notes users will be able to synchronize their contacts and calendar entries between SugarCRM and Notes, for example, and link e-mails and calendar entries in Notes to particular customer records in SugarCRM, he said. The company had already built some integration with LotusLive, and the acquisition will accelerate its Lotus integration plans by about a year, officials said. The terms of the deal weren’t disclosed. The acquisition was one of several IBM-related announcements at the show. SugarCRM also released software connectors for IBM’s Cognos and Cast Iron business intelligence software, and announced a CRM product bundle built around IBM’s system i software and Power servers. IBM said it would give resellers who sell the bundle a steep discount on its products. The partnership makes sense for both companies, analysts said. SugarCRM is used mostly by small and mid-sized companies, and partnering with IBM helps give it credibility among larger customers, said Paul Greenberg, owner of enterprise consulting company The 56 Group. It’s also strategic for IBM, which doesn’t have its own CRM or ERP applications. It gives IBM a set of CRM products that it can offer to its customers, ones that are extensible and can be customized to suit different needs, Greenberg said. Still, he and other analysts noted that SugarCRM is a relative newcomer to the enterprise market. Its products may be gaining features, but it will still have to build up the sales and support channels needed to serve big businesses, said Kate Leggett, a senior Forrester analyst. SugarCRM has “very big, strong competitors,” noted Joshua Greenbaum, principal at Enterprise Applications Consulting. Microsoft Dynamics is probably its biggest, most direct rival, since like SugarCRM it offers both on-demand and on-premise options. SugarCRM hopes its “open” model will distinguish it from competitors, CEO Larry Augustin said. As well as being open source, SugarCRM allows resellers to extend its software with new capabilities, which SugarCRM will audit so that they are supported along with its product. The company added 2,500 paying customers last year, he said, for a total of about 7,000. SugarCRM also became profitable for the first time last year, Augustine said. There is pent up demand for CRM systems in general, Greenbaum said. Some customers are ready to switch from aging Siebel systems that they bought at the time of the Y2K crisis, for example, and they may wish to look for a smaller vendor than Oracle, he said. The SugarCRM Spring Release will become generally available in the next month or two. It adds support for eight new languages, bringing the total to 22. They include Hebrew—made possible because the update now supports languages read from right to left. It also adds “social” features, which have become de rigeur for CRM systems. In Sugar’s case they include a partnership with InsideView, which aggregates data about companies and individuals from social networking sites such as Twitter, as well as from more traditional media such as Hoovers and Reuters. A free, basic version of InsideView will be included with all versions of SugarCRM. It provides information about a company’s structure, CEO and competitors, as well as the “buzz”—or what’s being said about a company—on social networking sites. The idea is to know more about a prospective client before calling them. The Spring Release also includes integration with Google Docs, and lets users fire up meetings from within SugarCRM using Cisco WebEx Meeting Center and Citrix-GoToMeeting. 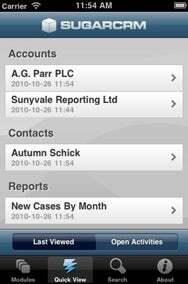 SugarCRM released an iPhone application last year, and the Spring Release will add native client applications for the iPad, Blackberry and Android devices. It also adds the ability to synchronize data to mobile devices and read it offline, though the user needs to be connected to make edits. SugarCRM comes in a free, open-source Community edition, as well as Professional and Enterprise editions priced at $30 per user per month and $50 per user per month, respectively.